Preparing a special event requires a lot of thorough planning to make it work. You are catering to people whose tastes and preferences may differ from yours. One of the challenges is playing your cards right to create an atmosphere that will be appreciated by everyone. This is when themes and motifs enter the picture. Parties and events that incorporate a theme try to transport their guests to a different time and place through their carefully designed paraphernalia. One of these is the party menu. If you’re currently working on your own event menu designs, take a look at the list we’ve prepared just for you. You might come across the design you’ve been looking for. Why Do You Need An Event Menu? 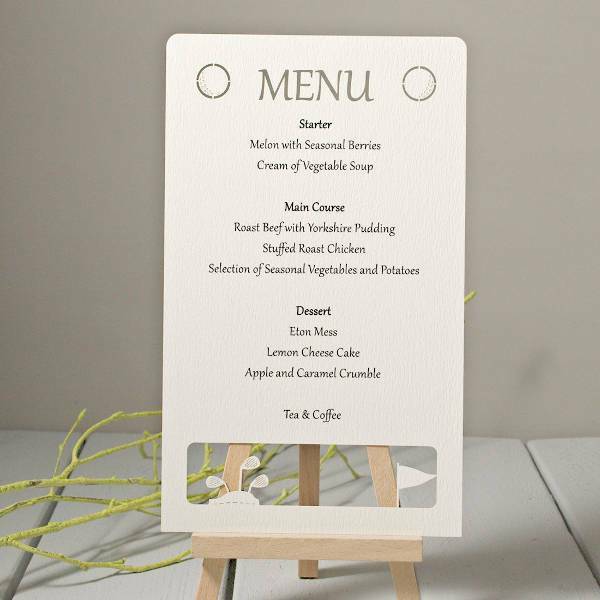 Menu cards play an important role in bringing your event together. It may not seem like it, but your event menu contains a lot of aesthetic and entertainment value. That is, if you design them right. Prior to that, it’s important to understand the menu’s function in your event for you to better appreciate them. 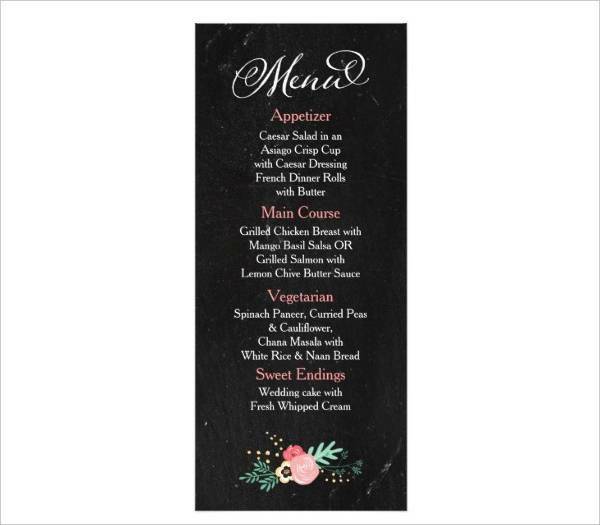 A menu card is a list of food and beverages offered in a particular venue (like a cafe or restaurant) or an event (like a formal dinner function or a cocktail party). Beyond being functional, menu cards are also ornamental. You can display them in a presentable manner that boosts the aesthetic value of your venue. Your event menu is part of a heightened and more enjoyable experience for your guests. How you present your list of meals should have as much bearing as the design of your invites. They have to be captivating to maintain a certain level of interest from your guests. Because the menu’s purpose goes far beyond its practical function, there should be much consideration and planning for the creation of an effective and excellent menu card design. You don’t necessarily have to be a pro at designing, you just have to instill the right mindset and be dedicated to making something valuable. Different occasions need different menu designs. In designing your event menu, try to think of your them or a desired look, and how you can best incorporate that on your card. There are different approaches you can take, and it’s all a matter of valuation and creative discretion. 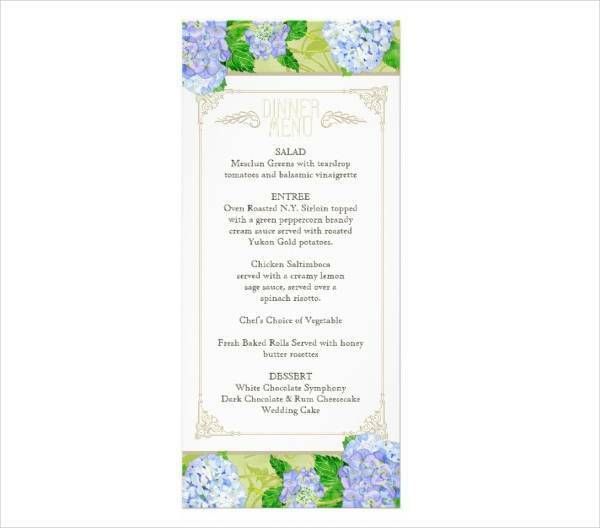 Designs for wedding menus are often dainty and delicate with simple font usage and minimal colors. 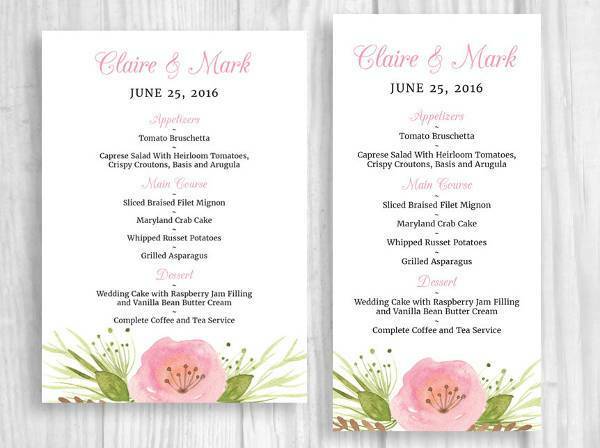 For a better and more appropriate outcome, your designs for your menu should strictly be in line with your wedding theme. 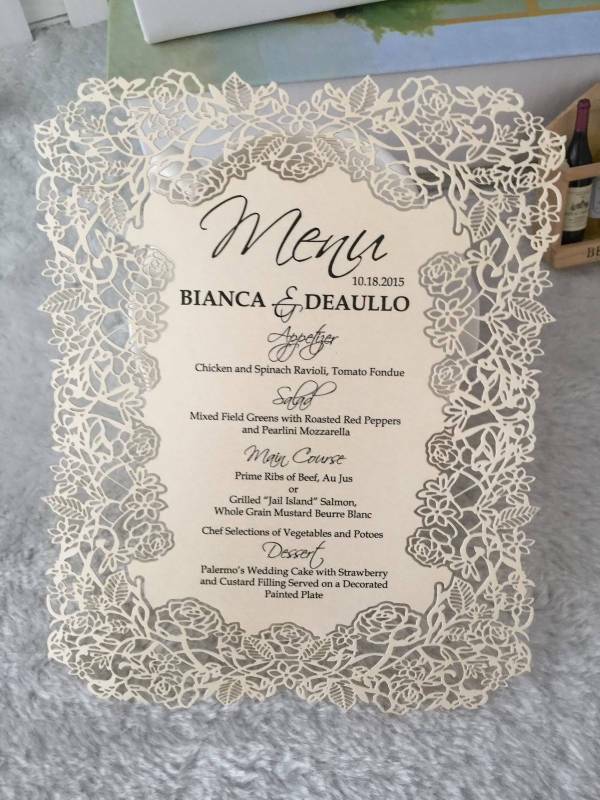 Our Vintage Wedding Event Menu is the epitome of romantic and elegant, with an intricate floral stencil cut-out for borders and typefaces limited to two styles. 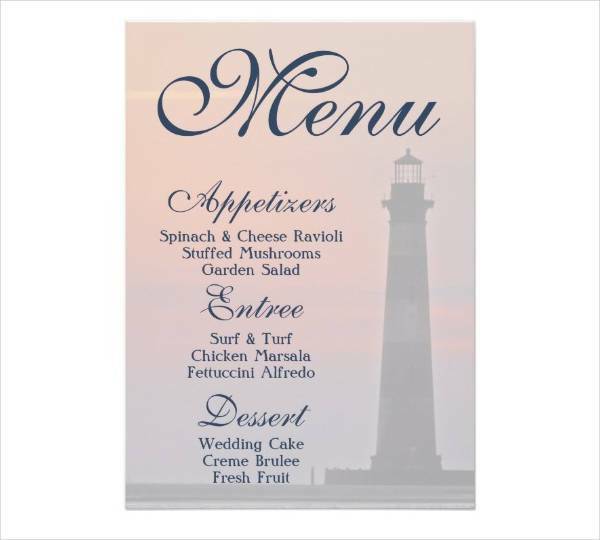 The Sample Wedding Reception Menu Card presents a dreamy gradient look with a silhouette of a lighthouse and an organized list of entrees and desserts. 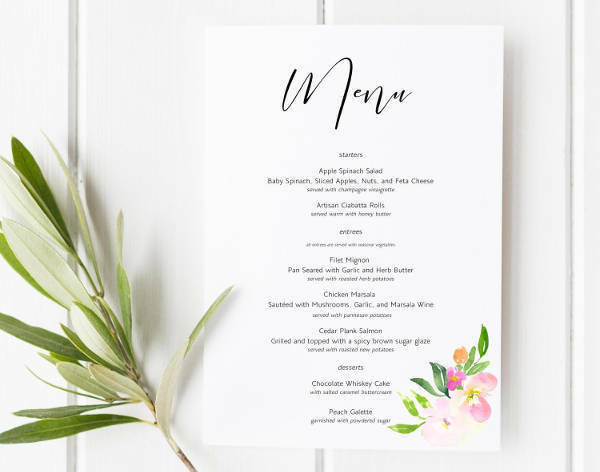 If you’re planning a special dinner party for the summer, make use of our Summer Event Party Menu, Summer Event Dinner Menu, and Floral Event Menu for some of the most charming floral designs. 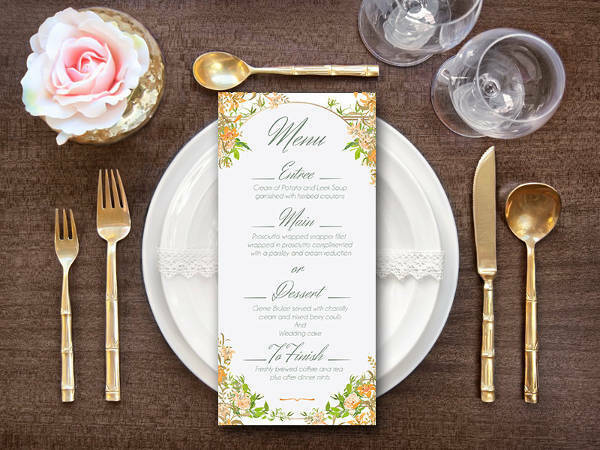 You can adorn your event menus with spring summer floral patterns with classy borders and delicate writing. You can also go for minimalism, limit your flower designs to one corner of your menu. A corporate event usually falls in the more formal and smart casual looks. Their event menus tend to follow suit, but there’s no harm in getting a little creative with your designs. Our Corporate Event Menu Card sets the right tone with a stencil cut-out of a golf course at the bottom of a clean and formal list of meals. Holiday dinner parties are especially not exempt from cool menu designs. 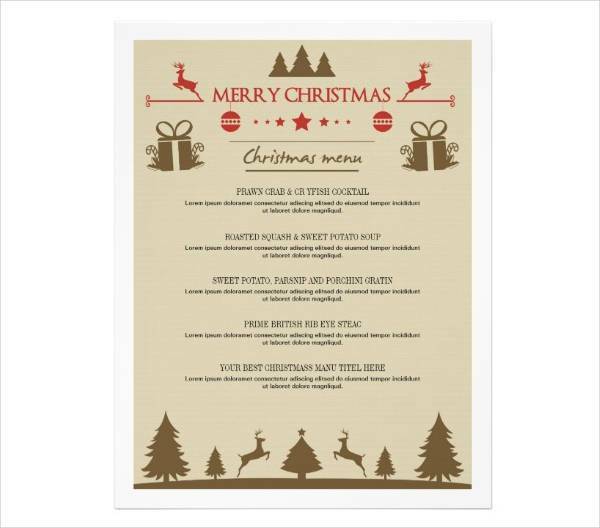 Download our Dinner Party Event Menu to get started on your Christmas menu cards with adorable illustrations. 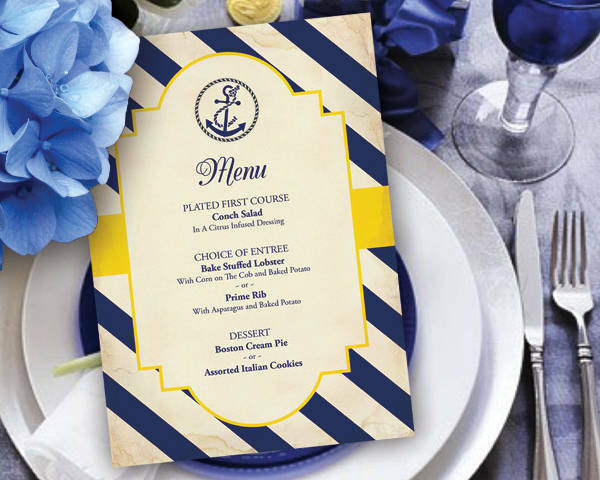 The quality of your event menu designs relies on how well you know your own event. That includes knowing your theme inside and out, having a significant level of understanding of your guests. Knowing your theme well means you know how your designs will look; and knowing how many of your guests will arrive and their preferences can better orient you with the food you’ll be preparing. There’s obviously a lot that goes into event menu designing. You have to be thorough and detailed to come up with the design that best exudes your desired look. 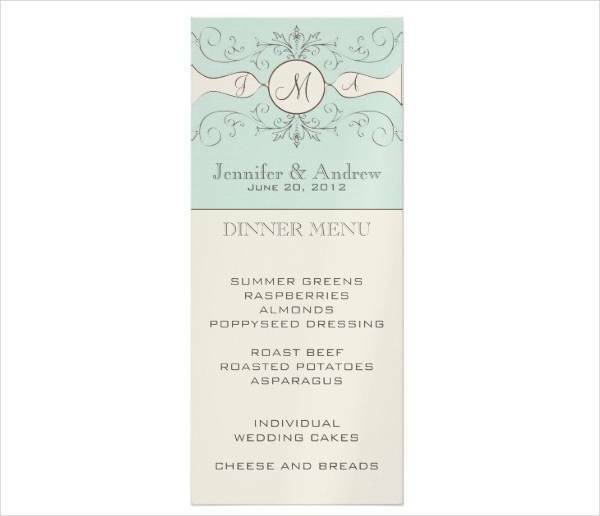 When it comes to the overall look of your menu card, it can turn out one of two ways: minimalist or detailed. A minimalist design keeps everything direct yet profound. There are no unnecessary details just as there are no designs out of place. Everything is kept to their minimum, with only the essentials to deliver a clear message. 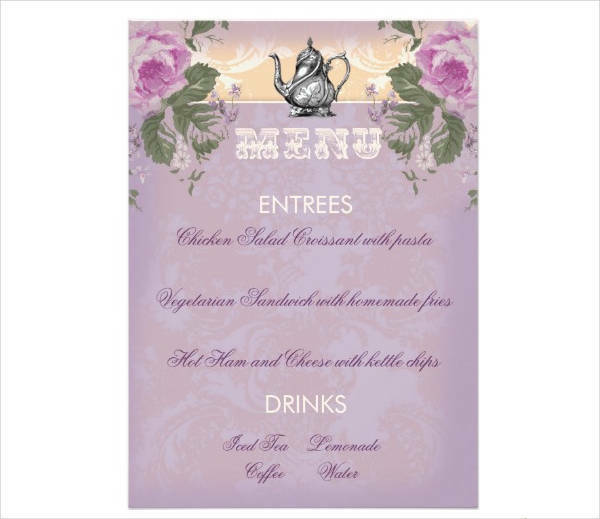 A detailed event menu design presents a vivid picture with a coherence in use of images, patterns, colors, and text. There is more visual stimulants in a detailed menu card, but they are just as profound as minimalist designs. 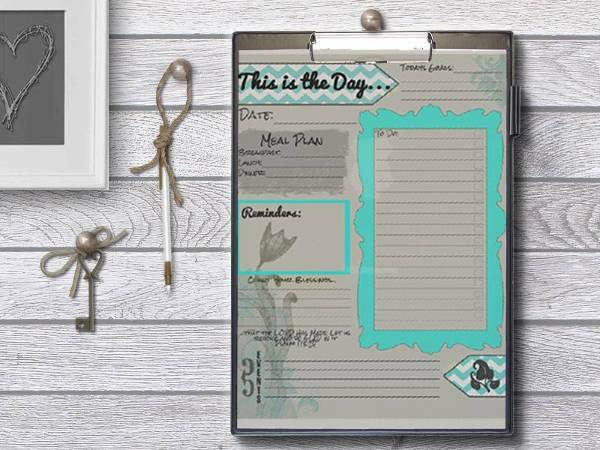 How you display your event menus is also part of bringing your whole event together. 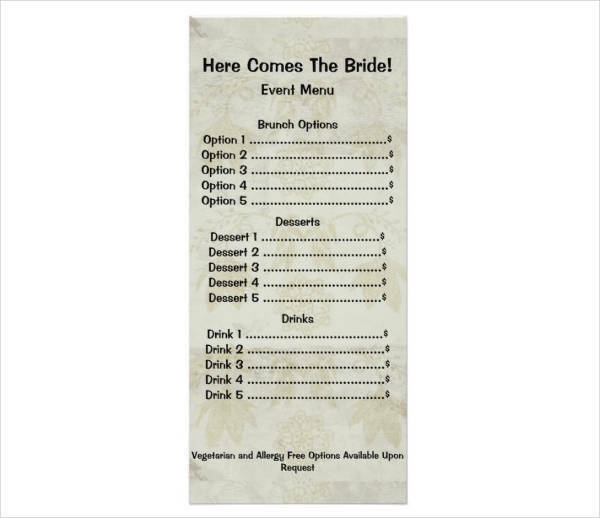 It also plays an important role in amplifying the quality of your menu cards themselves. A playful and creative display of your event menus show personality that couldn’t possibly be imitated anywhere else. If you’re throwing a spring summer luncheon or dinner party, put our menu cards in adorable garden baskets with flower petals on them. You can display them by the entrance, or set them as centerpieces on your tables. 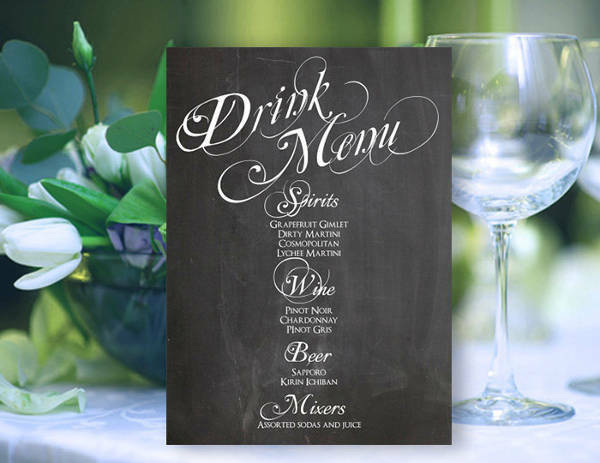 You can also hang your event menus by the bar or pin them on cork boards in a more contemporary setting. Beach themed weddings can place their menu cards in a mason jar filled with sand and seashells. There’s still plenty of display ideas and design ideas you can experiment with. Explore every possibility because inspiration can be found everywhere. 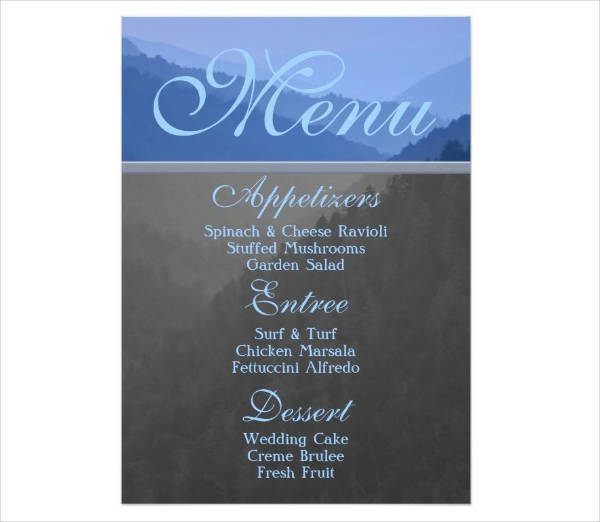 Let our list of event menu card designs be your starting point. Download our designs and edit them to better suit your preferences and ideal aesthetics. You can also get started on your event invitation design to create a harmonious look.